This walk perhaps more than any other is a walk through history, much of it still visible in front of your eyes; a divided city symbolically brought together by a Peace Bridge. 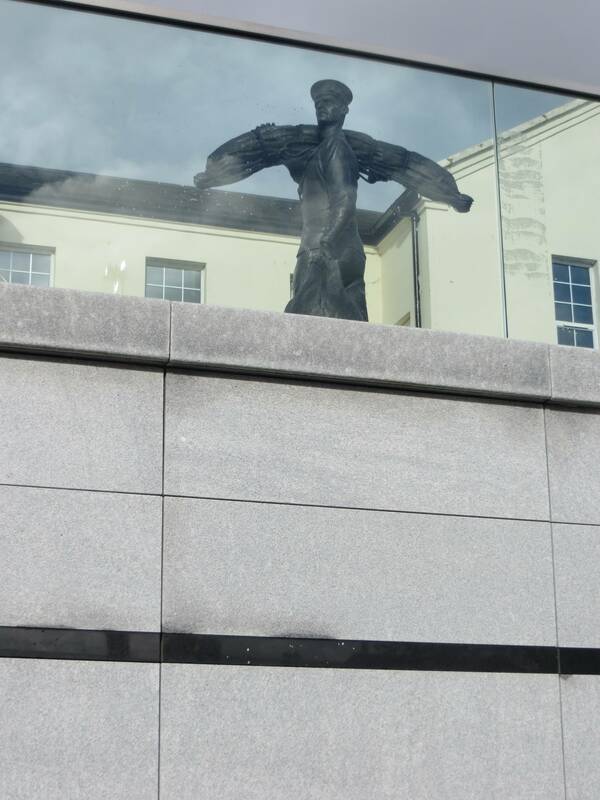 City status: In March 1613 a Royal Charter proclaimed the creation of the City of Londonderry. The new city and its hinterland were severed from County Donegal and combined with Coleraine County and County Tyrone. 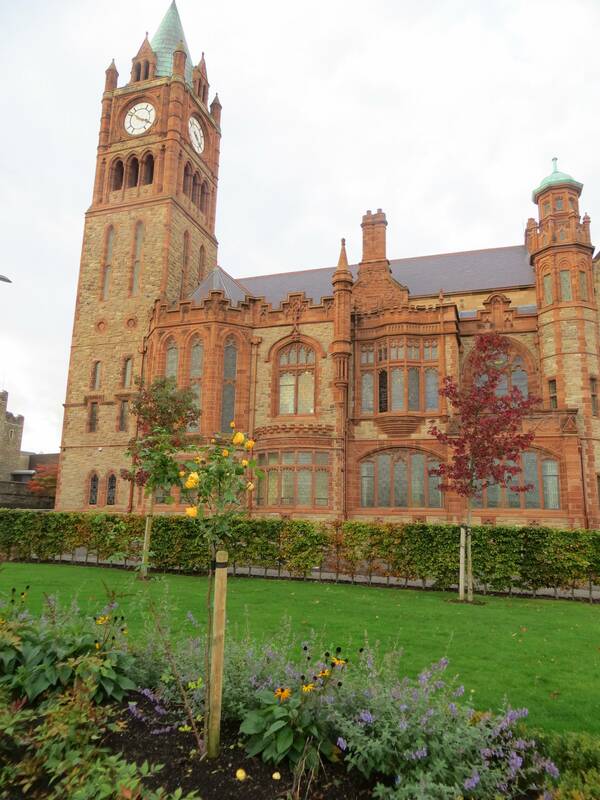 While the city is now more usually known as Derry, Londonderry is also commonly used and remains the legal name. 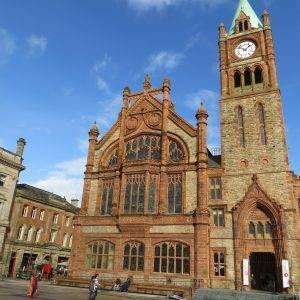 It looks ancient, but Derry is really a ‘new’ town; it’s just that it was created in the 1600s. The English set Derry up as a ‘Plantation’, funded by the London Merchant Guilds and laid out in a grid pattern, which was subsequently much copied in the colonies of British North America. They also added the prefix London to honour the benefactors, and the city became Londonderry. 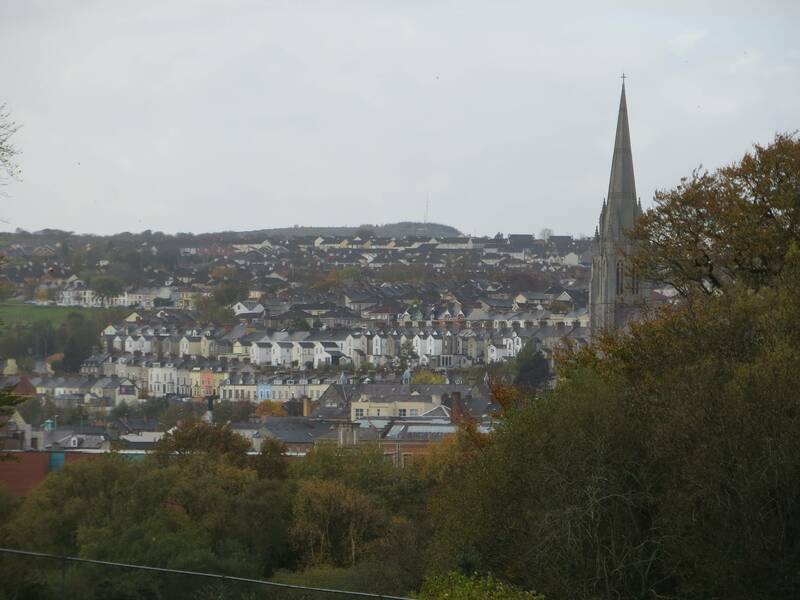 Derry is characterised by its distinctively hilly topography. 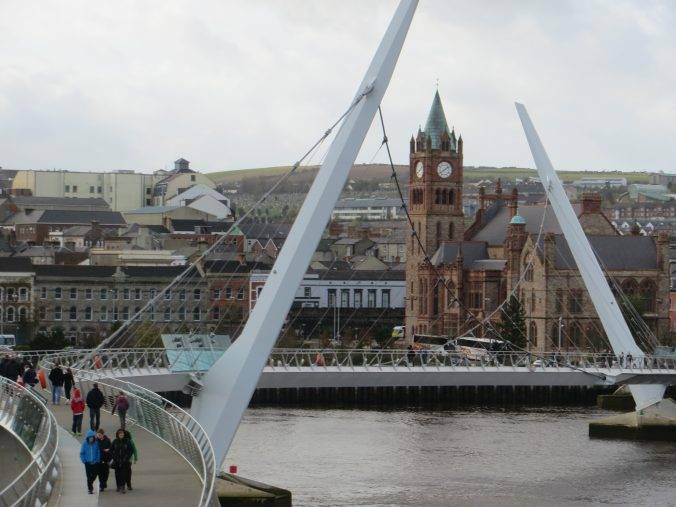 The River Foyle forms a deep valley as it flows through the city, making Derry a place of steep streets and sudden, far-reaching views. The original walled city lies on a hill on the west bank of the River Foyle. 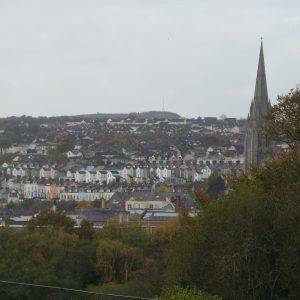 In the past, the river branched and enclosed this wooded hill as an island; over the centuries, however, the western branch of the river dried up and became a low-lying and boggy district, hence its name today, the Bogside. The Peace Bridge, opened in 2011, is symbolic of the transformation of the city itself, connecting the Catholic west with the Protestant east. 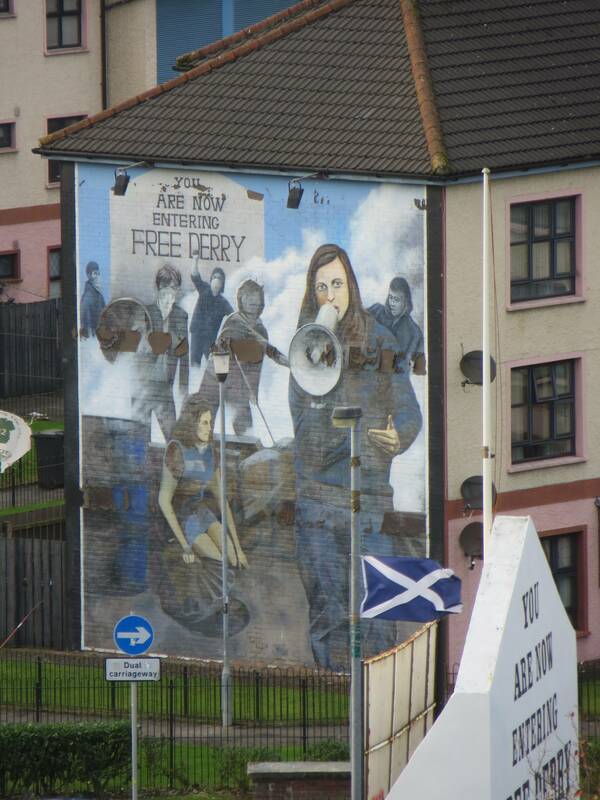 Peering down over the walls of Derry you still get that raw sense of the past, as you look out over the murals and flags which define the religious territories of the city. “This isn’t the way to the Peace Bridge,” Peter, my Irish friend and one of my walking companions for the day, helpfully pointed out; “it’s in exactly the opposite direction.” “I know Peter, but there’s plenty to see in the park first, then we swing round and will come back to the bridge.” Peter wasn’t entirely convinced and, as we stumbled a little bit to find the right route, he felt vindicated. 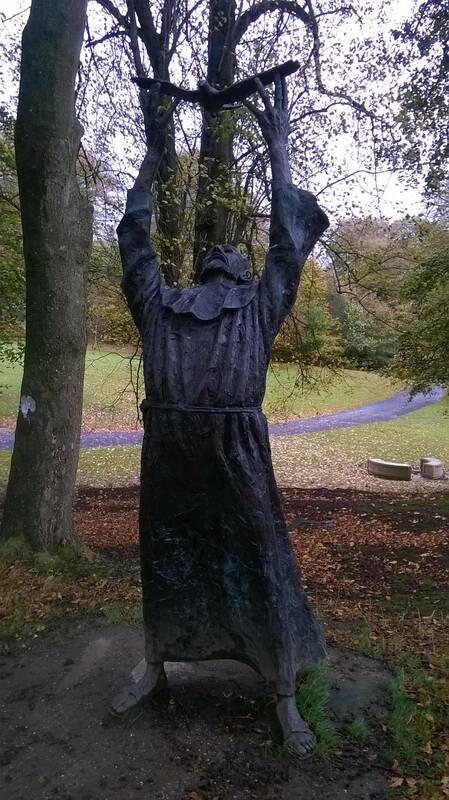 But St Columb’s Park (13 ha, 33 acres) certainly merits a look, being well placed on the edge of the Foyle. 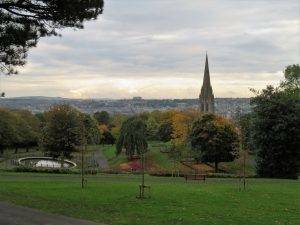 It dates back to 1845 as a public park when it was bought by the then Londonderry Corporation from the Hill Estate. As we reached the centre of the park, we came upon the ruins of a small church, St Brecan’s. Although the ruins you see only (!) 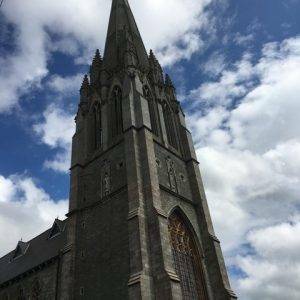 date back to about 1600, there had been a much older church on the site dating back to the 6th century when St Brecan first came to Ireland. 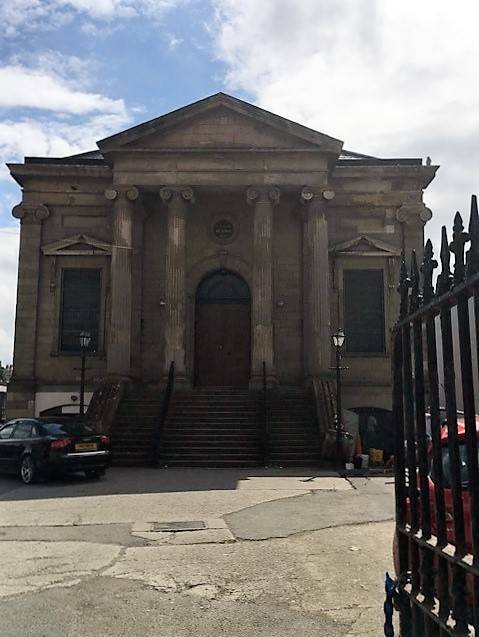 This makes it the oldest Christian foundation in the city. 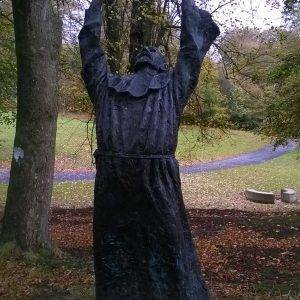 Another notable feature to look out for in the park is the statue of Derry’s patron saint, Saint Columba, stretching nine feet to the tip of his outstretched fingers letting go of a dove. It is the sort of uplifting piece of art which everyone in the park seems to make a bee-line for and be invigorated by. 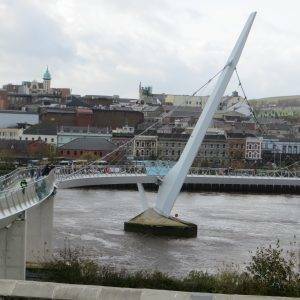 But in many ways, the best bit about coming to this park is the glorious views it affords of the Peace Bridge and the walled city of Derry on the far bank, glistening in the sunshine (last bit not always guaranteed, this is Ireland). It gives you a real sense of place. The Peace Bridge, opened in 2011, is a joyous triumph which connects up the two parts of the city. 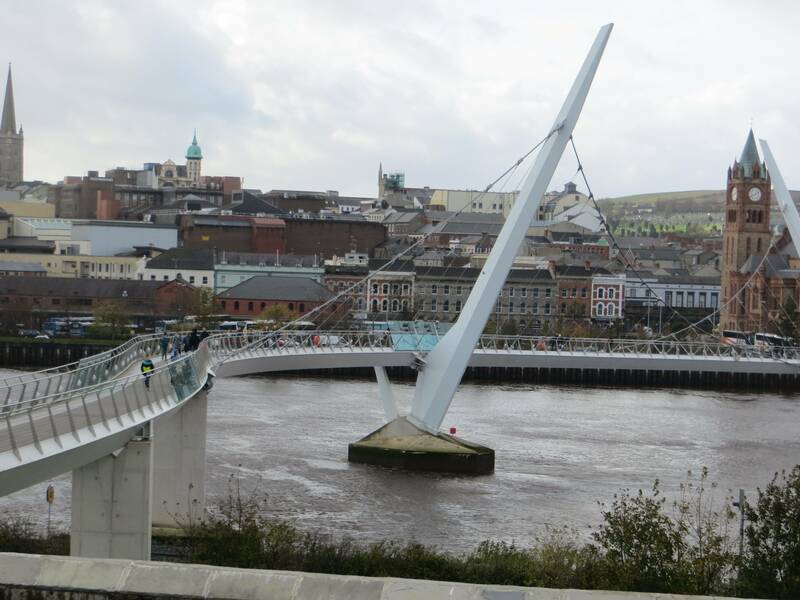 It was funded by the European Union as part of Derry’s regeneration programme and was designed by Wilkinson Eyre Architects who also designed the Gateshead Millennium Bridge over the River Tyne. More than a million people cross it every year, residents and visitors mingling happily in the pleasure of the views and the sense of a much better present. As we crossed the gleaming steel and glass construction we felt a sense of elation and enthusiastic anticipation of the walled city on the other side. It was in every way an uplifting experience. And for the record, Peter and I buried the hatchet of our route disagreement and shook hands enthusiastically on the bridge. Peace certainly broke out for us. 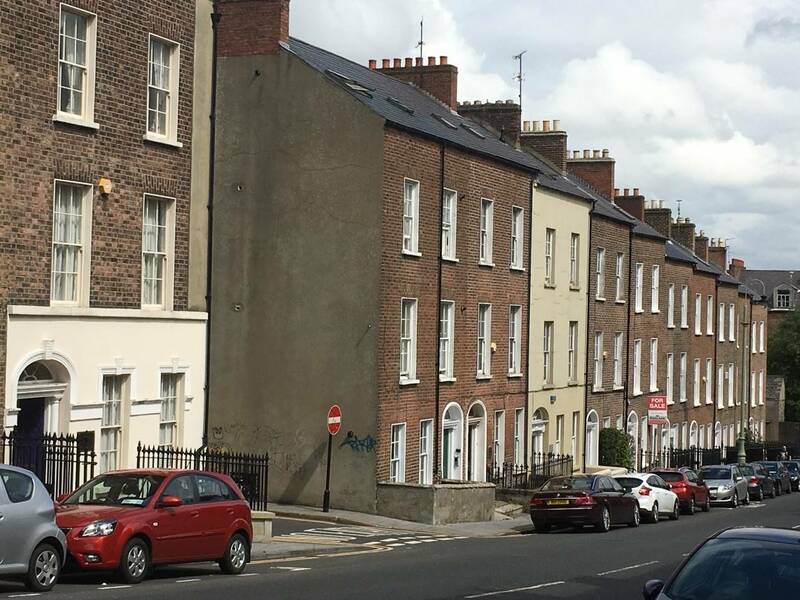 We started our walk in Clarendon Street, which is a pleasant surprise coming off the Strand Road, which is a rather uninspiring shopping street. It is a lovely street of Georgian Houses, most of which are now Offices, that rise up a gentle hill. At the top of the hill, you reach Northland Road, which is a mix of Victorian Terraces and more modern flats. A slightly dodgy triangular junction which you carefully cross over and turn left into Infirmary Road. Leading up to the newly refurbished gates of Brooke Park , during 2016 a £5 million project was undertaken to upgrade the park facilities, including a Play Garden, Horticultural training centre, Contact Sports Centre, a synthetic pitch, and restoration of the historic Victorian Park Features. The result is very impressive. Great James Street itself is not terribly exciting, although the brightly painted pub on the corner is quite typical of city pubs – and a useful landmark. 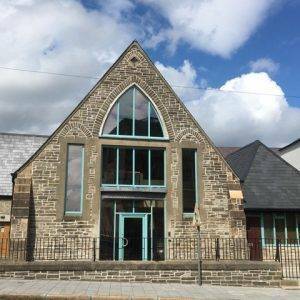 Continuing down the road, to the Culturlann Ui Chanain, the award-winning Irish Language arts and cultural centre. The building is an interesting fusion of existing Georgian architecture and fairly brutalist modern architecture. Certainly a ‘Marmite’ building, and one not easily ignored. Next door to this is the old Glass Works, built in 1837, a relic from Londonderry’s industrial past. 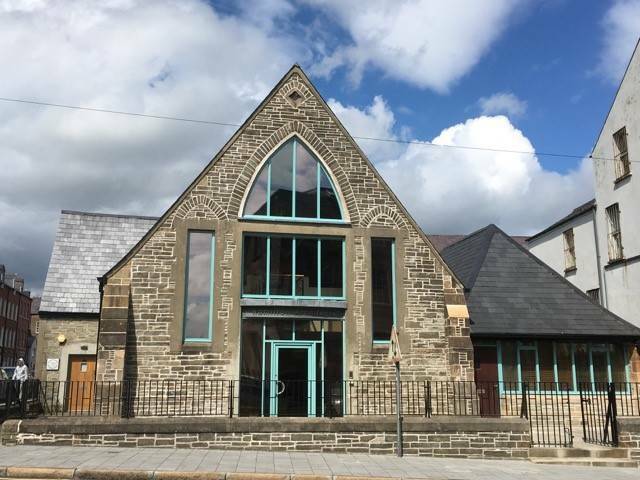 For those of you that prefer your modern architecture to be a little more sympathetic to the original building, on the opposite side of the road to the Cultural Centre, is a former Church, now an architect’s offices. 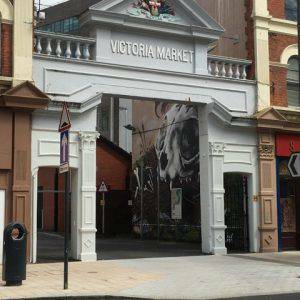 That ended our part of the walk, however, we then turned right back onto Strand Road, and past the gates to the old Victoria Market, which as some impressive street art on the wall behind. We topped off the walk with a walk around the Victorian Guildhall, which is set in a lovely pedestrian square. 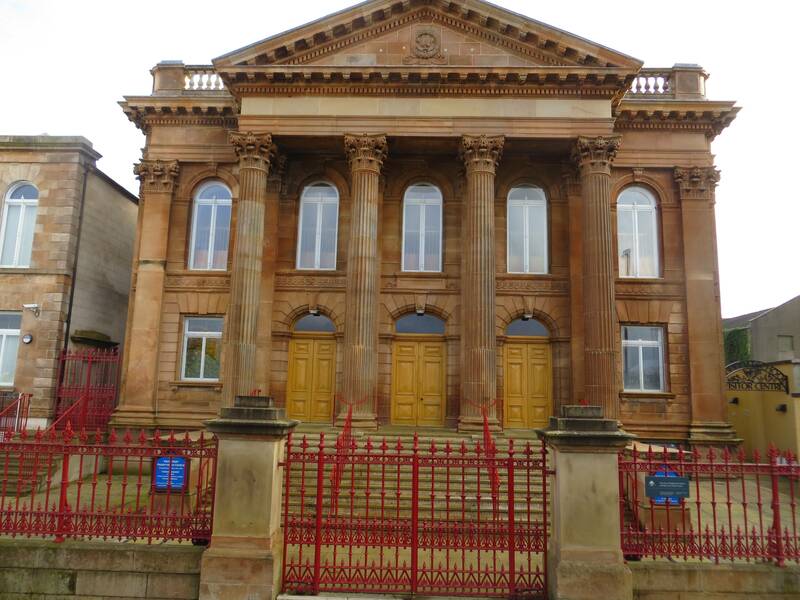 Visitors are very welcome, and inside is a small exhibition about the history of the city, together with a lovely little café, with a terrace overlooking the River Foyle. On the day we visited an elderly man from Drogheda was having a ‘tinkle’ on the organ in the great hall – not very well it has to be said, so Maurice climbed up into the Organ loft to give him an impromptu lesson! Inside are some fine examples of Victorian stained glass windows, so well worth a quick look. 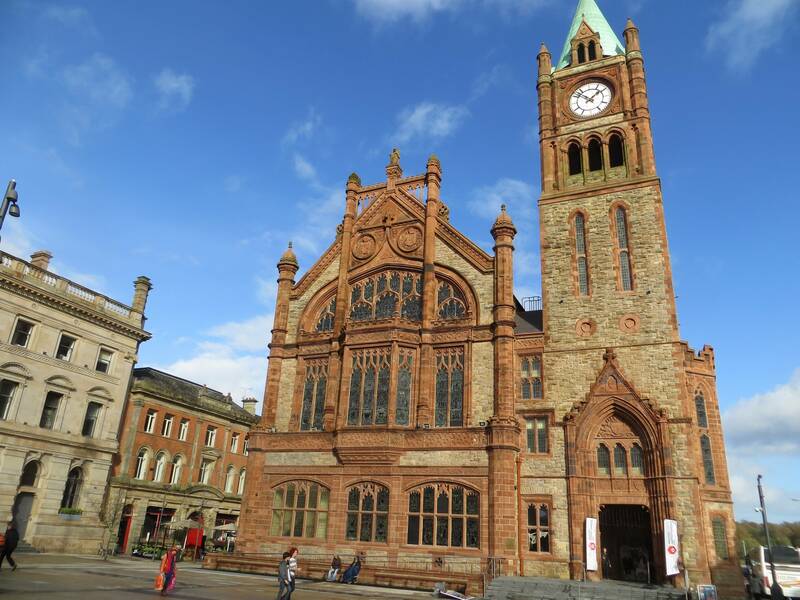 The square in front of the Guildhall is the main city square of Derry, regularly playing host to important events. It was the staging area for the visit of US President Bill Clinton when he visited the city in 1995. 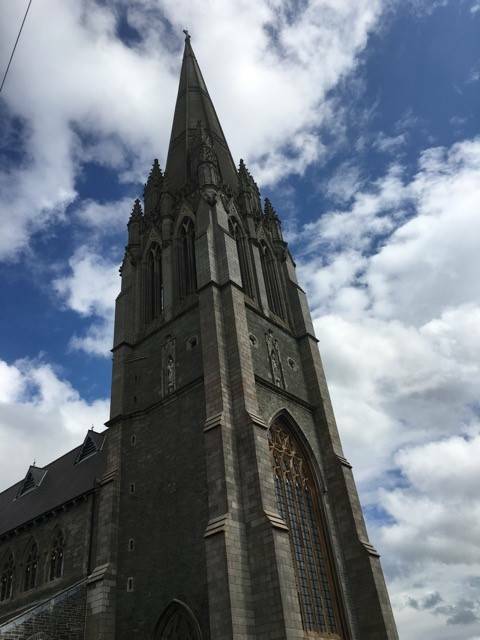 Fashioned in neo-gothic style, The Guildhall is a beautiful building; especially notable are its stained-glass windows which tell the history of the city. 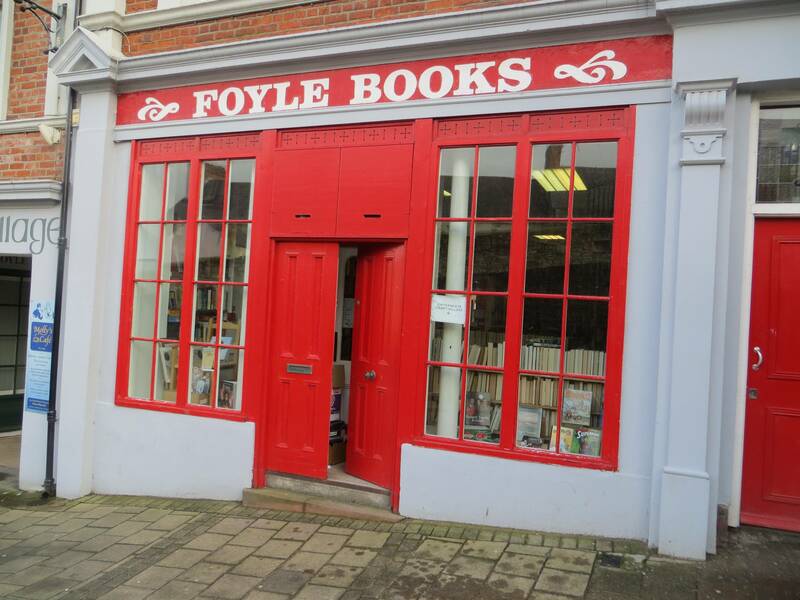 It was built in 1887 on land reclaimed from the River Foyle and named in honour of its connection to the City of London and its guilds. We climbed onto the town walls up some steps just through Shipquay Gate. In the 17th century, the River Foyle lapped this part of the walls, and Shipquay Gate opened onto the waterfront. 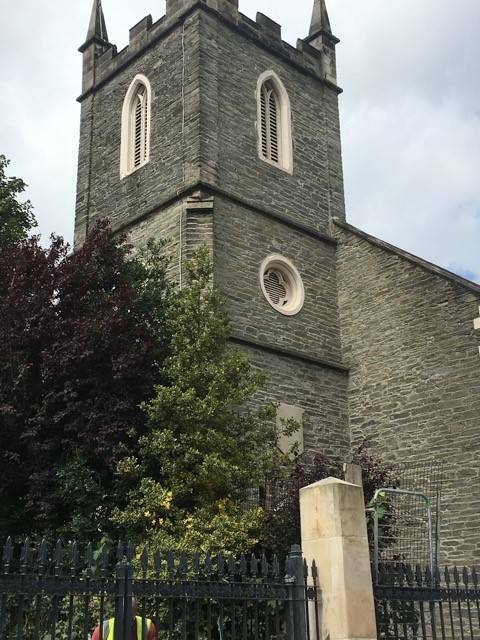 It was here that, in 1945, Field Marshal Montgomery and Field Marshal Alexander, both from Irish families with connections to the city, were awarded the Freedom of the city. 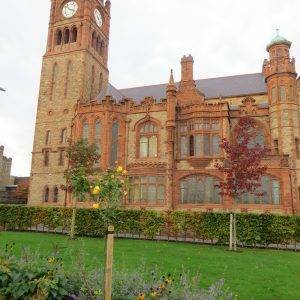 Derry is the only remaining completely intact walled city in Ireland and one of the finest examples of a walled city in Europe. The Walls were built between 1613–1619 as defences for settlers from England and Scotland. The walls, which are 1.6 km in circumference and which vary in height and width between 3.7 and 10.7 metres, are completely intact. They provide a unique promenade to view the layout of the inner city. The four original gates are Bishop’s Gate, Ferryquay Gate, Butcher Gate and Shipquay Gate. Three further gates were added later, Magazine Gate, Castle Gate and New Gate, making seven gates in total. It is one of the few cities in Europe that never saw its fortifications breached, withstanding several sieges; including the famous 1689 Siege of Derry, which lasted 105 days. The city, a Williamite stronghold, was besieged by a Jacobite army until it was relieved by Royal Navy ships that eventually broke through a blockade across the river. 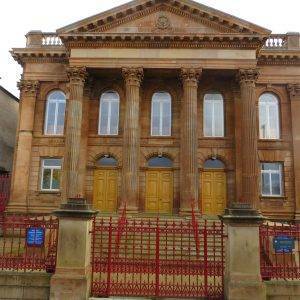 The siege, in which some 8,000 inhabitants died of disease and starvation, is commemorated every year by the Protestant Apprentice Boys of Derry who parade around the walls of the city. 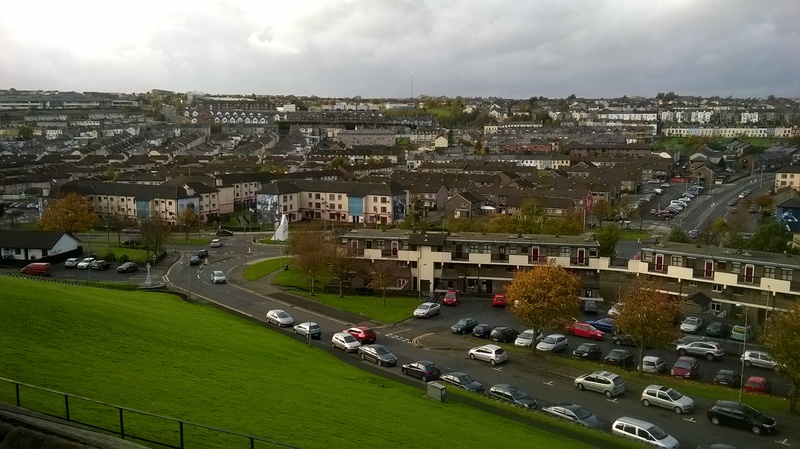 As we walked along the west wall over Butcher Gate, so we started to get a grandstand view of the Bogside, a staunch Catholic district where so many of the Troubles were played out. 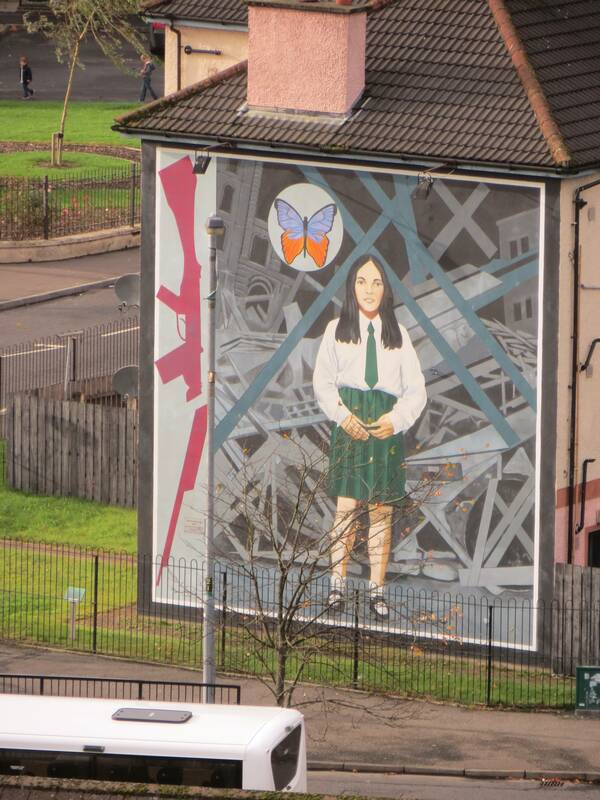 It all begun with the Battle of the Bogside in 1969. The rioting erupted as Irish nationalists threw stones and nails at the Apprentice Boys Parade which was passing along the city walls (there is still some protective high fencing in place today, mainly as a historical reminder). Fierce rioting broke out between unionists and the police on one side and nationalists on the other. Rioting between police and Bogside residents continued for three days. The police were unable to enter the area and eventually, the British Army was deployed to restore order. 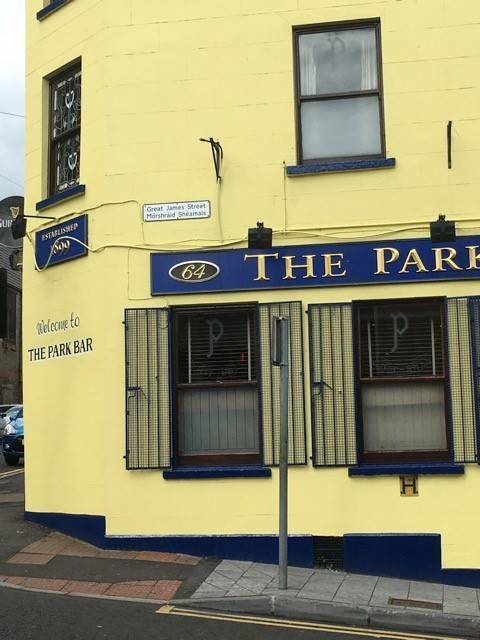 The riot, which sparked widespread violence elsewhere in Northern Ireland, is commonly seen as one of the first major confrontations in the Troubles. 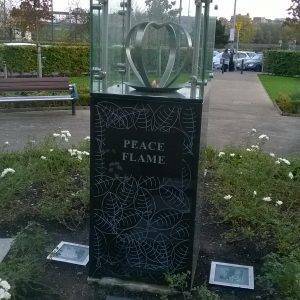 It was here too, in 1972, that Bloody Sunday took place, on which day fourteen unarmed protestors were shot and killed by the British Army. The 12-year Saville enquiry into Bloody Sunday, which concluded in 2010 that the killings were both ‘unjustified and unjustifiable’, was held at the Guildhall, which we passed earlier. 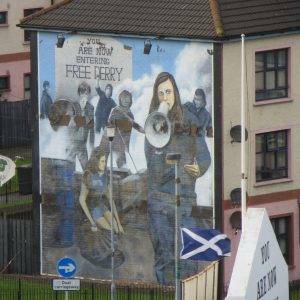 Today the large gable-wall murals by The Bogside Artists and Free Derry Corner are popular tourist attractions. Moving round to the east side of the walls, in a somewhat sombre mood, we looked down on The Fountain, the only remaining area of Protestantism on this side of the river, also decked in murals but this time with union flags. 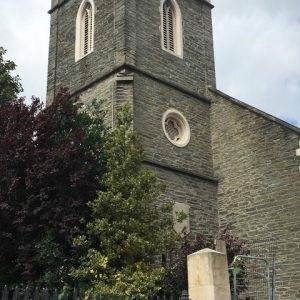 Next, we came off the wall into the churchyard of St Columb’s; completed in 1633, it has the notable distinction of being the first cathedral to be built for the Anglican Communion after the Reformation. The cathedral is famous for another reason too. Cecil Frances Alexander, the wife of Archbishop Alexander, was a Victorian hymn writer and poet who, amongst other works, wrote the hymns “All Things Bright and Beautiful”, “There is a Green Hill Far Away” and “Once in Royal David’s City”. 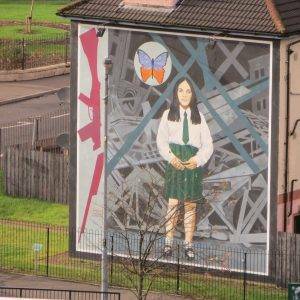 She is commemorated by an Ulster History Circle blue plaque in nearby Bishop Street. 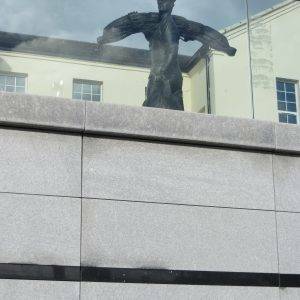 After all the heavy history, it is something of a relief to reach the Playhouse and Centre for Contemporary Art (CCA) and reflect on the artistic and cultural renaissance of the city, which was stimulated massively by it being designated the inaugural European City of Culture in 2013. 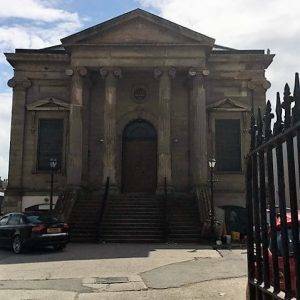 The Playhouse was established by Pauline Ross in 1992 with a grant of just £300. Since then it has grown to become one of Ireland’s leading award-winning multi-disciplinary Community Art Resource Centres. 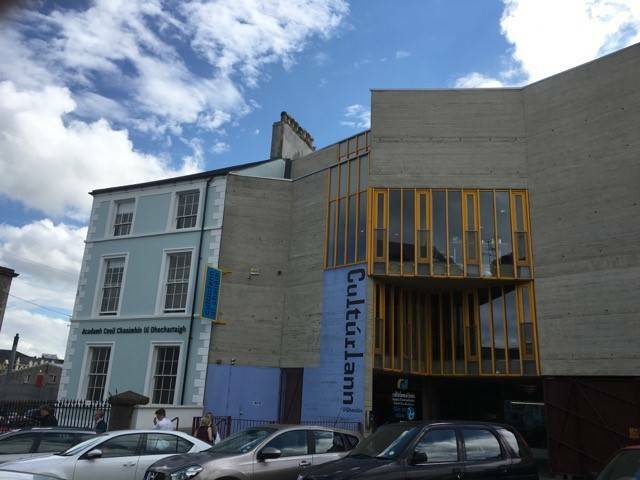 The Centre for Contemporary Art (CCA) developed out of the Context Gallery in The Playhouse. 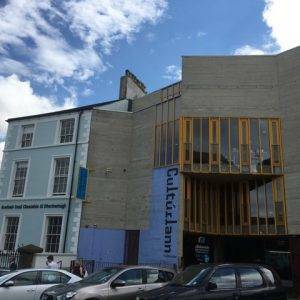 Since its conception in 1992, the gallery has exhibited emerging artists from Northern Ireland alongside international peers. It has enjoyed much success with several Turner Prize nominees and winners amongst its alumni. 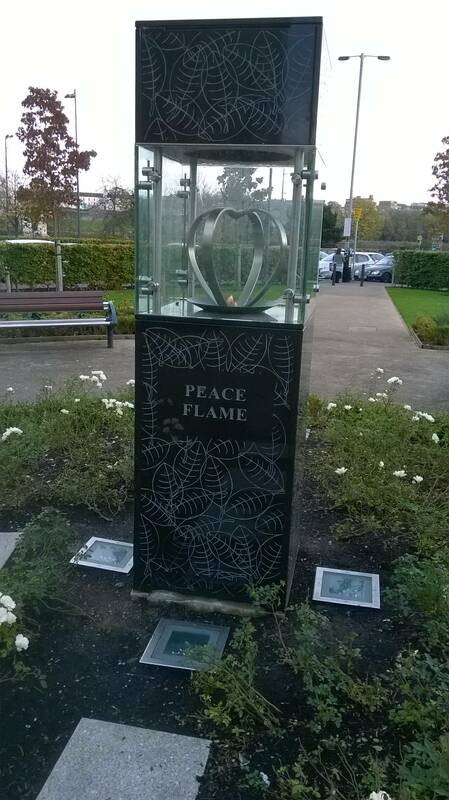 As we headed back to the river, we passed the Guildhall on our left and walked past the Peace Flame monument, designed by local architect Shane Birney, erected in the centre of a small semi-formal garden. 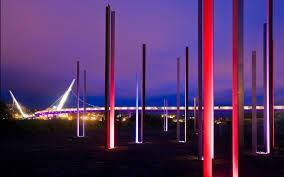 Crossing back over the Peace Bridge, we saw on the far bank Mute Meadow, an art installation comprising 40 pairs of columns, created by Turner Prize nominees Vong Phaophanit and Claire Oboussier. At night the columns are illuminated with colours from the palette of the stained-glass used in the Guildhall windows. The changing sequence of colours is guided by a compendium of city sounds. During the day, however, it doesn’t look so great, looking alarmingly like the beginnings of a large retail shed. 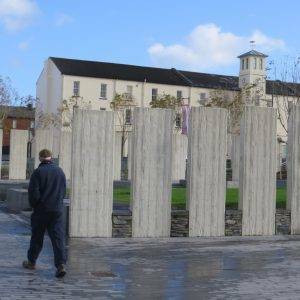 Once over the bridge, there is a graded slope through the old wall and up into the heart of the impressive Ebrington Square. 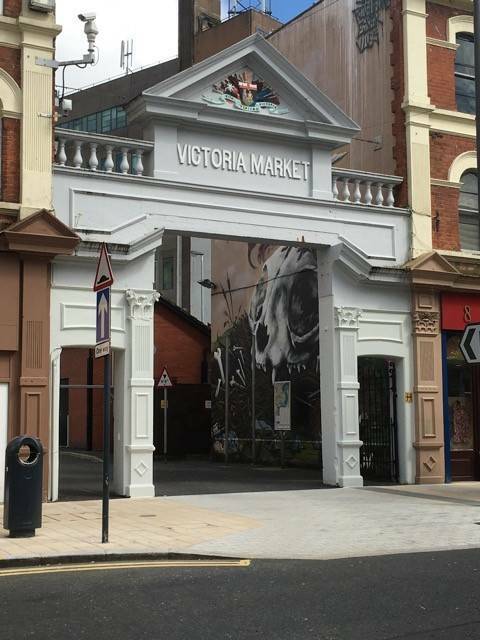 The square opened in early 2012 after a period of regeneration and hosted a number of events during the city’s time as UK City of Culture in 2013. 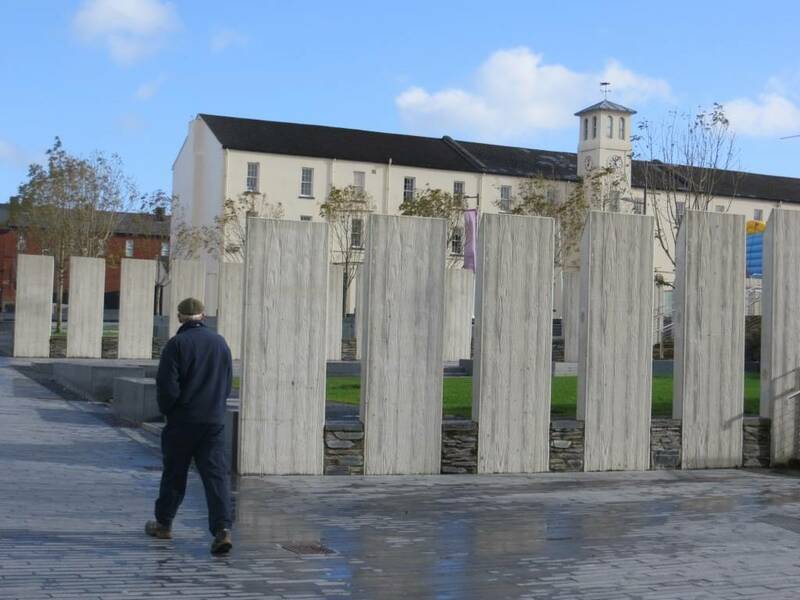 The Ebrington Barracks have experienced just about every twist of Derry’s long military history: King James II built a star-shaped fort on the site from which he attacked Derry in the siege of 1689. The present barracks, named after Hugh Fortescue, Viscount Ebrington (later Earl Fortescue), were built on the site in 1841. The 27th Regiment of Foot and the 109th Regiment of Foot were originally based on the site. During the Second World War, the barracks were used by American troops. The base was then handed over to the Royal Navy and became a depot for ships refuelling and taking on munitions. And latterly, during the Troubles, the barracks were the base for the British Army. The barracks were finally closed in 2003. A great walk through history, and a big thumbs-up for the major improvements of the last few years making this a delightful and rewarding small city to walk around. Swing round to the left at the top of the barracks and you will find an exit back onto the Columb’s Rd and your start point. Cafe Del Mondo, The Craft Village, Shipquay St, BT48 6AR (Tel: 028 7136 6877 www.mycafedelmondo.com) Multi-cultural bistro, with organic locally sourced produce & beautifully crafted patisserie. (Tel: 028 7127 2517) The only café on Derry’s walls. 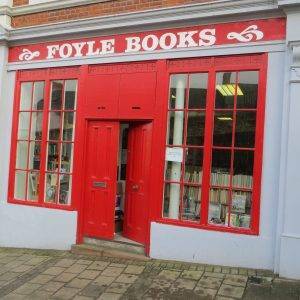 The manager Peter Mackenzie has played a major part in the literary culture in the city for the past 35 years. The Craft Village in the NE corner of the old City recreates an 18th-century street and a 19th-century square, with a picturesque jumble of cafés and shops, including a bookshop, craft shops, crystal ware and even a specialist dance shop. Tower Museum, Union Hall Place, BT48 6LU (Tel: 028 7137 2411) A museum explaining the political conflict that has shaped the city and the country. Also, has an exhibit on the Armada Shipwreck. The Museum of Free Derry, 55 Glenfada Park, BT48 9DR (Tel: 028 7136 0880 www.museumoffreederry.org) An archive focusing on the civil rights era of the 1960s and the Free Derry/early troubles era of the 1970s. Love your new website – and definitely going to try some walks, will do Londonderry when staying at Malin Head in July. But could you title it correctly Derry/Londonderry, Uncle Maurice would not approve !